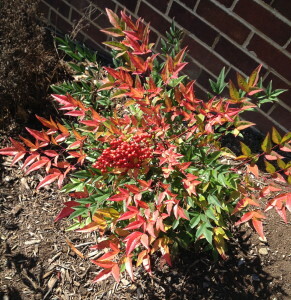 The neon shades of the nandina always make me smile. 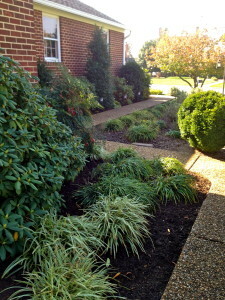 I finally had the time to divide all the liriope and fill in the walkway. Done! 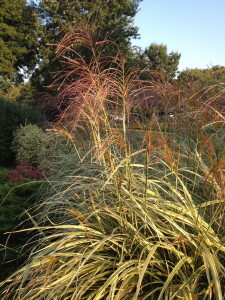 The variegated grass this year is the best it has ever looked. 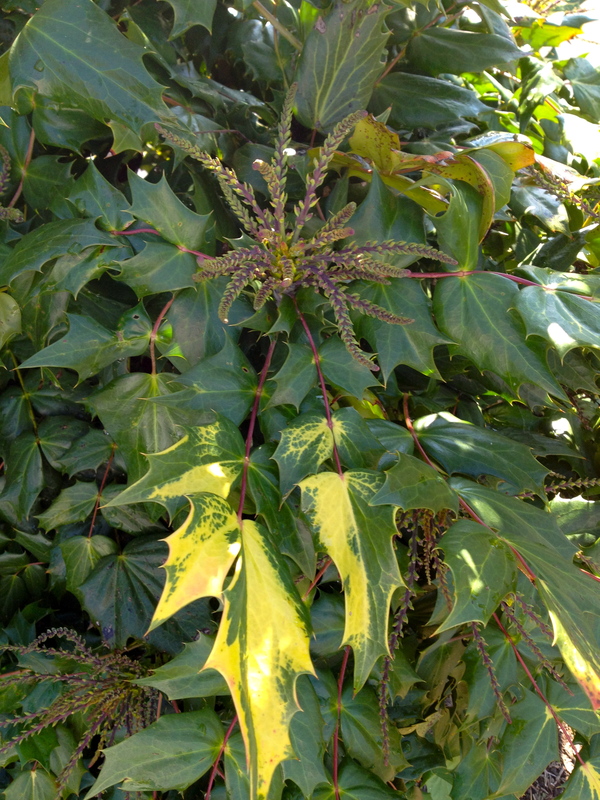 Even the mahonia leaves look splashed with fall color. 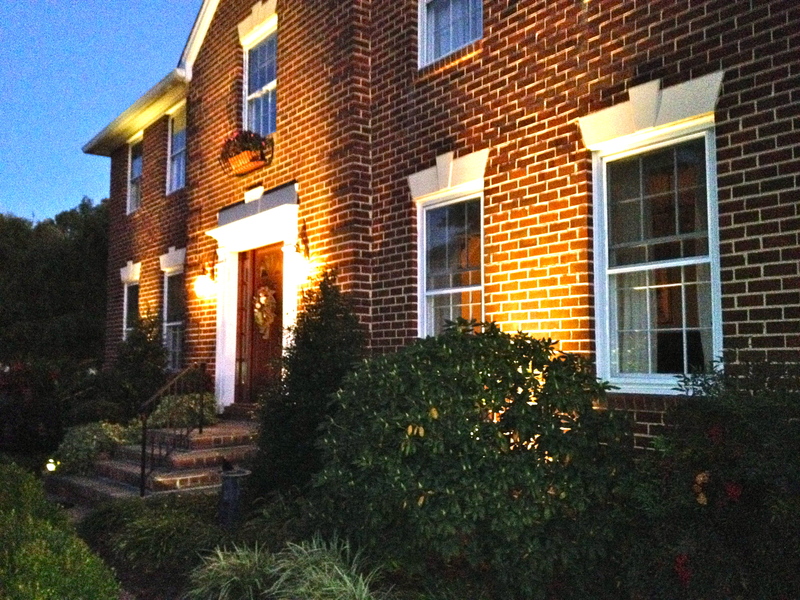 The new uplighting in the garden — more on this soon! Enjoy your evening! The passing storm that ushered in the cooler temperatures. I love the great pictures that can be taken in the Fall. The harsh angle of the sun can cast some very interesting shadows and highlight colors and textures. 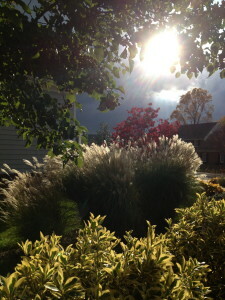 I was outside right after a storm pushed through and captured this shot. The weather has definitely turned crisp around here. 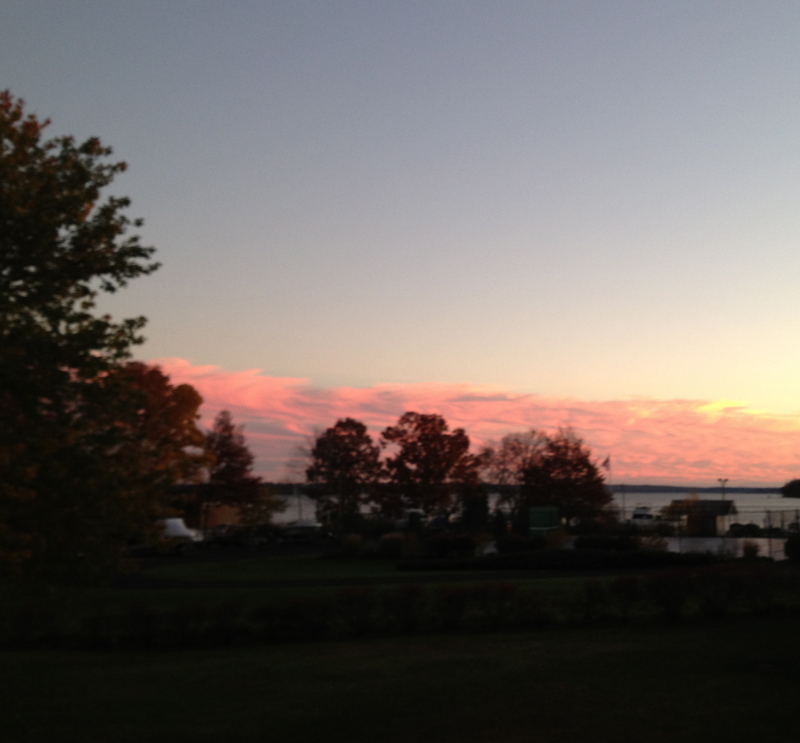 The days are shorter, which has made for some pretty color shifts. 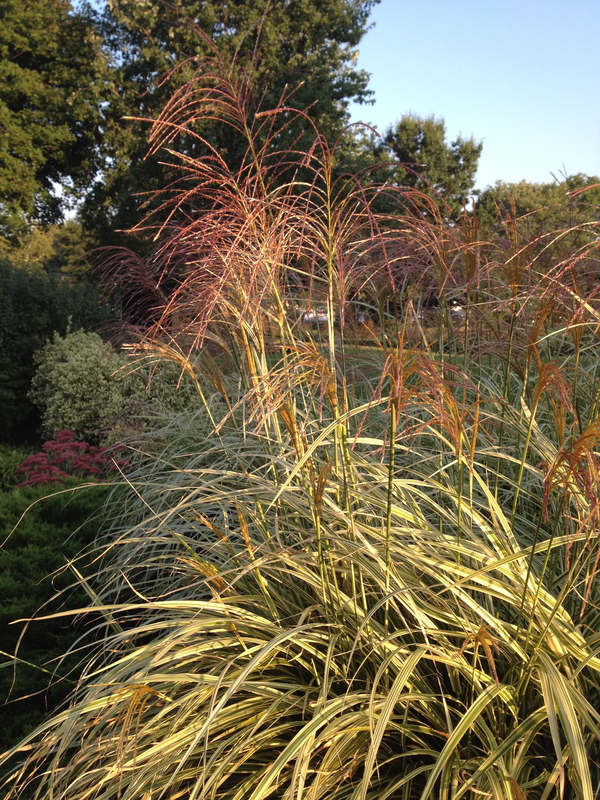 I love the red of this dogwood tree against the ornamental grasses. The Autumnal shades have been scarce this season around here, and most of the trees in my yard are still green, so this is welcome. Gorgeous golden colors of Fall. 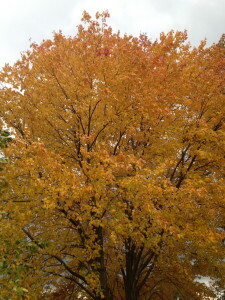 This tree is right across the hedgerow and is always one of the first to change color. It’s striking shade of gold makes it one of my most favorites. It doesn’t last long, so I always photograph it as soon as it turns. The colors are like a tapestry. It’s Autumn – What to Do with All the Leaves! 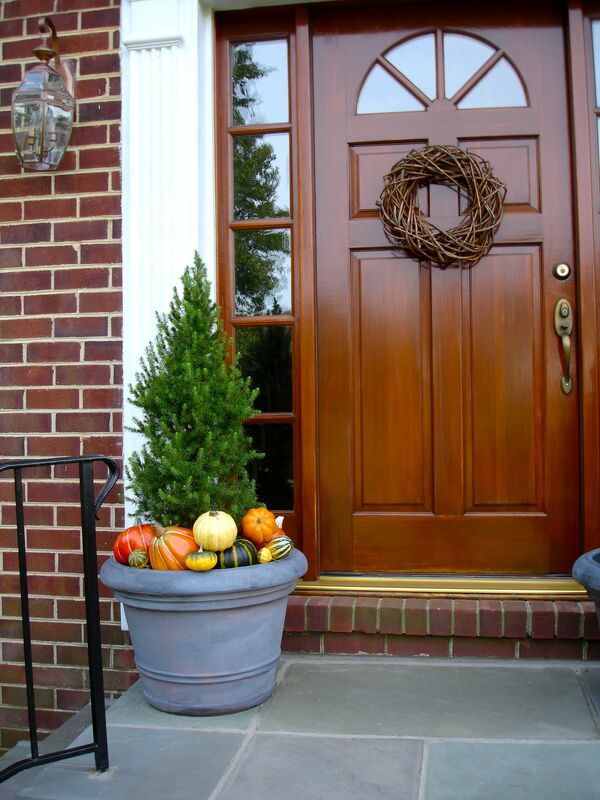 Gourds by the front door -- it must be Autumn! Autumn is here, and with it an abundance of fallen leaves. 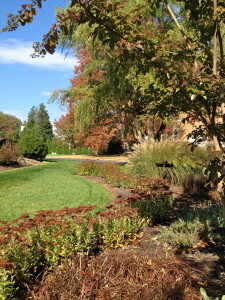 There are always questions as to what to do with them all — rake, mulch, compost, or ignore. There are many options. I will help you figure out what is best for your yard. If we are talking about the leaves which fall on the grass, it is my opinion that it is best to collect them. When they are left on the lawn, they can compact and mold can soon become a problem. 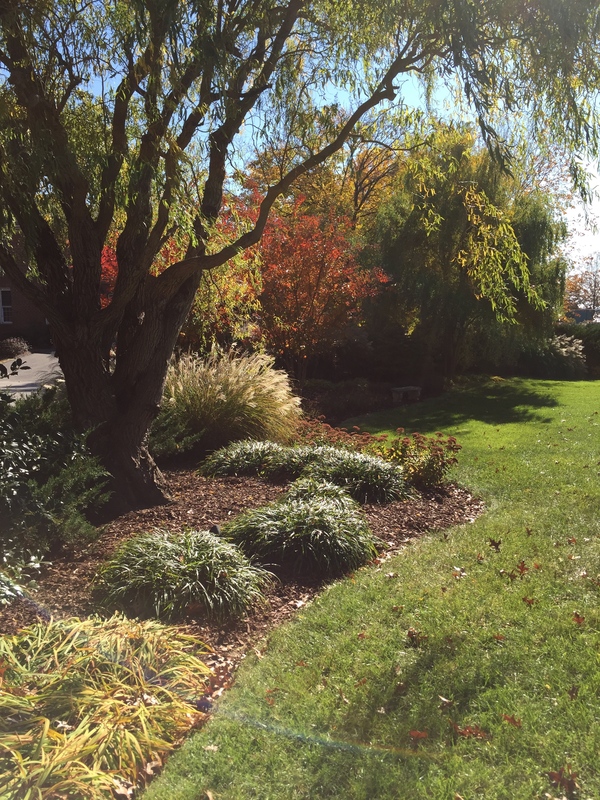 If they are mulched into the lawn with a mulching mower, they can be too acidic and wreck the delicate PH balance that is so important to a beautiful healthy lawn. Also — a little known fact — they will not decompose properly and will become a thatch problem, once the overnight temperatures are below 55 degrees. 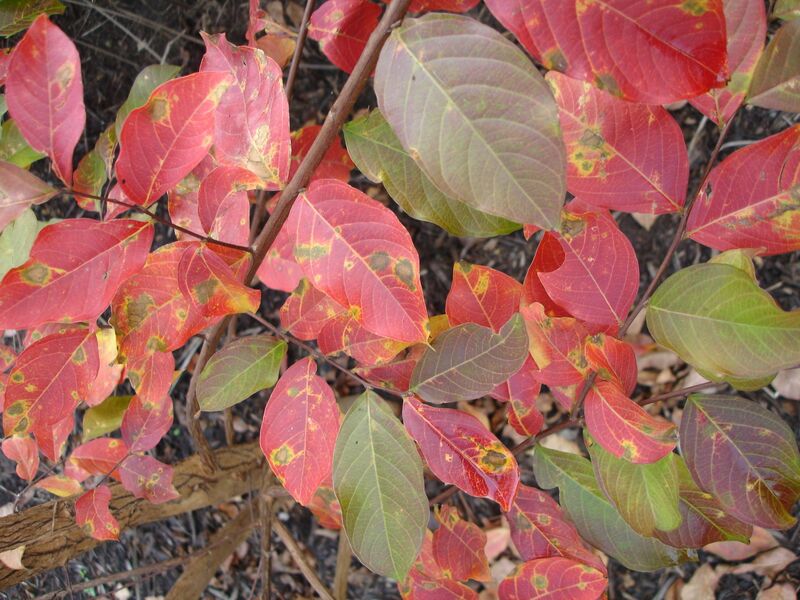 You will notice that these crepe myrtle leaves have spots. This is common on many trees as the leaves lose their chlorophyll. Do not apply a fungicide; when new leaves emerge in the spring they will be all green. One of the easiest, back-friendly ways of collecting leaves is to bag them with the mower. Just be sure to empty the bag frequently, as it will fill quickly! This works well if your leaves are less than an inch thick on the lawn. If they are thicker than that, your best option is raking or using a leaf blower. My personal favorite style of rake is the really wide plastic sweep with a padded handle so you do not get blisters on your hands. 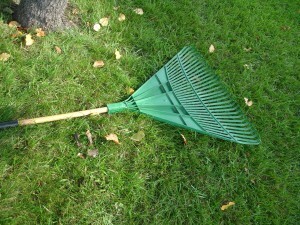 My favorite style of leaf rake. This one has a very wide sweep and a padded handle. It lasts forever, too! This one is 20 years old. I also like using a mower to collect the leaves, because it starts the composting process by chopping the leaves up into small pieces. If you have the space in your yard for a compost bin, this is the perfect time to start one! Just layer in brown (fallen leaves), then green (grass clippings). When you have a few minutes give it a stir with a garden fork, just a few times over the winter should do it. By spring you will have a wonderful amendment to stir into your flowerbeds or as a top dressing around bushes. The only place it is best to ignore the fallen leaves is in a wooded setting where there is no grass. They will provide a layer of warmth to the tree roots over the winter. As they decompose, they will be the perfect PH for their setting, because they are falling onto the soil below the tree where they came from. Thank you, Mother Nature! 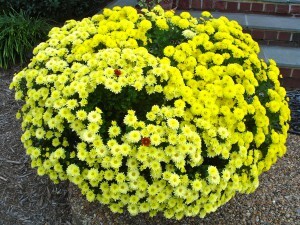 One of the most beautiful flowers of Autumn is the Chrysanthemum. 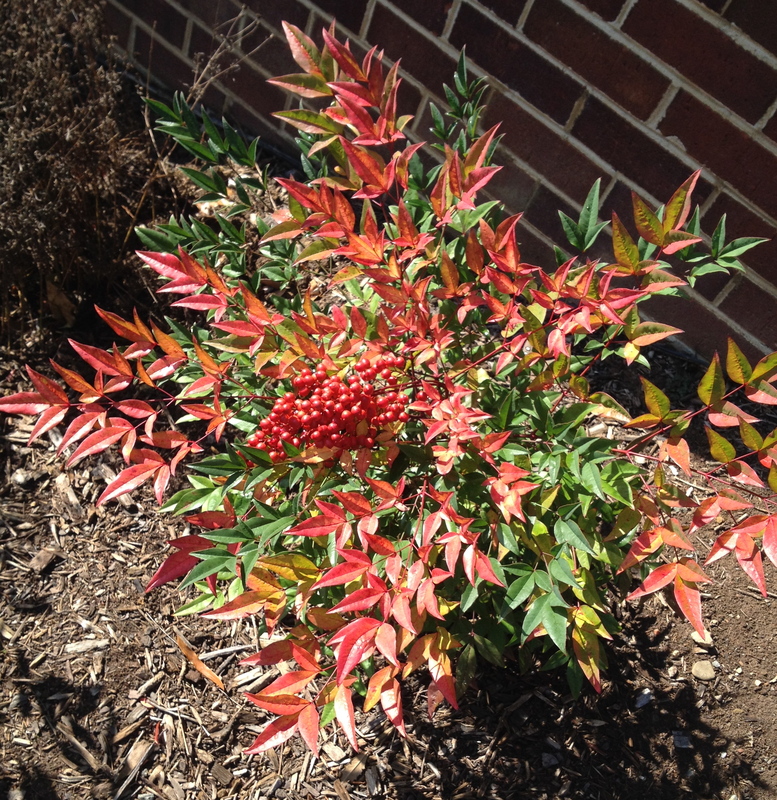 It is best to hand pick the leaves out of flower bushes, their delicate branches can break easily. I know it is a common practice to use a blower in the garden beds; please do not do this. It is like putting your bushes through a hurricane with the force of the wind the blowers produce. Never a good thing! Even though it takes a bit more time to pick the leaves out, or rake them out, it’s worth it for the health of your plants. 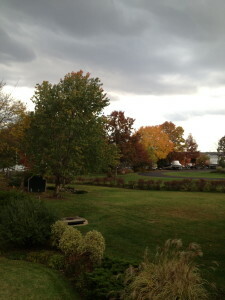 It is so nice to get out into the fresh Autumn air. I like the chance to put the yard to rest for the winter to come. I hope you think so, too. Enjoy!